"The Computer Is Your Friend. The Computer wants you to be happy. Happiness is mandatory. Failure to be happy is treason. Treason is punishable by summary execution." An oppressive regime requires its citizens to "be happy". Of course, this doesn't actually make them happy; it only gives them one more thing to fear, since beating your subjects for an emotional state is more likely to reinforce their negative emotions. The regime may be small scale. For example, it might be a parent or boss. When the regime actually controls the world, it's a Crapsack World. 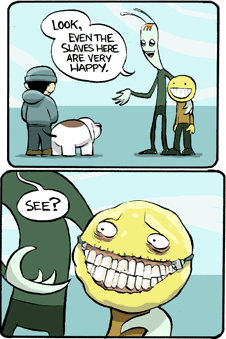 Often without added saccharine, since "be happy, or else" doesn't actually make the world look like a happy place; in fact, it's more likely to simply highlight the depressing atmosphere even more. Why does the regime do this? Well, maybe it is simply insane or enjoys toying with its underlings For the Evulz, or they may be trying to paper over the fact that Dystopia Is Hard. The regime is perhaps trying to subject its populace to Stockholm Syndrome. Or through Insane Troll Logic, because beating is so effective to control the population, it can be applied as well to emotional states. Either way, the demands for happiness tend to underscore the regime's 0% Approval Rating. If this trope was inverted, it would be much easier for the citizens to follow - since the law itself would already give them something to be unhappy about. See also Getting Smilies Painted on Your Soul, where people actually do become happy whether they like it or not, such as by Government Drug Enforcement. In the Fables spinoff comic "Cinderella: From Fabletown with Love" Cinderella's fairy godmother decides she'd conquer a world, and force people to act happy until they became happy. Played with in a The Wizard of Id strip. The King is showing a visiting noble around, and the noble asks a peasant how things are for him, and gets the reply, "I can't complain." The noble says that's nice and asks why, and is told, "It's forbidden." In one Mickey Mouse story, Mickey and Goofy meet a deranged monarch who has taken this Up to Eleven. He explains that he has no unhappy subjects, because if they are unhappy they are imprisoned. Then, to demonstrate, he asks a random peasant whether he is happy. The peasant grins maniacally and seemingly sincerely and says that he is happy... and the king promptly orders him thrown into jail. Mickey: But he was happy! King: Yes, but he is sad now - and I aim to prevent crime before it happens! In Flash Gordon during Ming's wedding scene, a ship flies over head with a banner reading "ALL CITIZENS SHALL MAKE MERRY," followed by another one with "...ON PAIN OF DEATH." Distributing affordable drugs in large quantities makes it a borderline case with Government Drug Enforcement. In Witches Abroad, Lily Weatherwax is an evil fairy godmother that turns Genua into an Expy of Disney Land, where everyone is happy and laughing... because the ones that aren't, disappear. In 1984, people are required to love Big Brother and be happy about it. In Slave World, this is used as an addition to Getting Smilies Painted on Your Soul: The slaves are biochemically altered for certain kinds of happiness, and they get punished if they try to resist the effect. Inverted in Mr. Men/Little Miss story Little Miss Sunshine (not the movie about the infant beauty contest), the titular character visits Miseryland, where the inhabitants are kept miserable simply because of a sign stating the laws: "No smiling, no laughing, no chuckling. Giggling forbidden by order of the king." Naturally, Miss Sunshine is able to turn the kingdom around by simply changing the wording of the sign. In the Hard To Be A God at some moment freshly established theocracy punishes people for "non-exstatic way of thinking". In The Giver, it's more like "Quiet Contentment is Mandatory", since excess emotion is discouraged in the dystopian society. In Doctor Who, this is the the entire point of the Happiness Patrol. The fairy-tale kingdom of Happy Valley from Monty Python's Flying Circus. The subjects were always happy all the time because, by royal decree, anyone who wasn't happy would be put to death. One subject whose wife had just died is seen being arrested, tried, convicted and sentenced to hang by the neck until he cheers up. The Twilight Zone TOS episode "It's a Good Life", based on the Jerome Bixby short story. A mutant 6-year-old child with incredible powers requires that everyone be happy around him. Anyone who isn't gets "sent to the cornfield". Mystery Science Theater 3000 has "Lawgiver Day", wherein, as described by poor Professor Bobo, "all are ordered to make merry and be light of heart, under pain of horrible lingering death." REM's song "Shiny Happy People" was a parody and a deconstruction of Chinese government propaganda following the Tiananmen Square crackdowns, which essentially ordered everyone to be happy (and be compelled to disregard what had just happened). The song's lyrics become darker once this all sinks in. Shostakovich's Fifth Symphony. He tacked on a happy ending to his symphony so that the Stalin (who was seriously considering imprisoning or executing Shostakovich) would think he is writing music to glorify the regime. In fact, many of his works essentially embody this trope. "The Straight Razor Cabaret" by Voltaire is about a macabre vaudeville show whose master of ceremonies mutilates the faces of anyone he thinks isn't enjoying his show enough. "Weird Al" Yankovic's 2014 CD Mandatory Fun mocks this concept with Soviet-style imagery and a stern-faced Al in military garb. Paranoia has this as a major part of its base premise. See the page quote. This game is also the Trope Namer. Inverted in Alpha State, where morbid depression is mandatory. One of the many facets of the 2056 juncture from Feng Shui. One of Ravenloft's lesser domains was home to a king who had no sense of humor, who'd clumsily tried to simulate one by requiring all citizens to laugh with every sentence they spoke. As he couldn't tell a real laugh from a forced one, this resulted in people who weren't particularly happy or amused saying "ha ha ha" after each statement. In the video game Floyd (also known as The Feeble Files), the Omnibrain demands happiness. Solving one of the early puzzles in the game gets an innocent civilian executed on the spot for being unhappy. Skyrim: Grelod the Kind has quite a way with children. Grelod: Hroar's crying is keeping me up at night. I'll give you one chance to talk the tears out of him, or he's getting the belt. World of Warcraft contains a Shout-Out to the Trope Namer, Paranoia. The Arcane Constructs patrolling Silvermoon will occasionally say "Happiness is mandatory, citizen", as part of the theme being built around the Blood Elves (mostly during Burning Crusade) that, while everything is beautiful and perfect on the surface, if you look a little deeper things aren't so nice. Ultima V has this as a major plot point. Where in Ultima IV your aim was to demonstrate the eight Virtues (e.g. honesty, humility, and compassion), the dictator that has sprung up in part five enforces all of them on pain of torture. "Thou shalt help those in need... or thou shalt suffer the same need!" Inverted in Normality. Nobody in Neutropolis is allowed to show any signs of happiness, lest to be taken away to be "normalized". Kingdom Hearts has Donald stating that the Gummi Ship only functions when the pilots are "Smiling". This could've been a Blatant Lie to snap Sora out of an incoming Heroic BSOD, and we rarely see the pilots inside the ship, so who knows? The manga leaves no room for doubt, though: You HAVE to be smiling when aboard the damn thing. In the Sluggy Freelance arc "758449", Riff finds himself in an alternate dimension city-state which enforces perpetual happiness with knockout drug injections at the slightest hint of discontent. Saturday Morning Breakfast Cereal has its fun with this. This is an official policy on TV Tropes. After making an unpopular Let's Play video, the Nostalgia Critic has to act positive during his review of James and the Giant Peach, partly because of this trope and partly because I Just Want to Be Loved. If he complains about something in the movie, the fans start pointing their guns at him until he goes back to praising it. Similarly, in The Angry Video Game Nerd's review of the Friday The Thirteenth NES game, Jason is hiding behind the couch ready to kill him if he says anything bad about the game. This being the Angry Video Game Nerd, he ends up fighting back and killing him by the end, then proceeding to call out everything bad about the game. In a Simpsons "Treehouse of Horror" story, Homer's time traveling creates a dystopian present in which Ned Flanders rules the world and requires everyone to be happy all the time. Those who don't comply are given a "re-Neducation" culminating in a lobotomy. Another example from The Simpsons is the episode where they all have nightmares. Bart's dream is all about having psychic powers and everybody in Springfield walks around thinking "happy thoughts" so as not to displease him and be turned into something weird in a spoof of It's A Good Life. In Fairly Oddparents, Timmy's time traveling caused his father to turn into a power hungry dictator whose main rule is 'Be Happy Or Else'. In Coraline, the Other Mother becomes dissatisfied with the Other Wybie's tendancy to not smile, so she sews his smile in place. A common saying among the lower ranks of enlisted men in the U.S. military is, "The beatings will continue until morale improves!" A specifically naval variation is "There will be no liberty until morale improves." Events hosted to boost morale and which have required attendance (particularly on what would otherwise be a day off) are called "Mandatory Fun" events. This saying can also be found tacked to many a cubicle wall in Corporate America. "You can't not have fun at Disney World. It's not Allowed." He claimed that if you're seen not having fun, you get abducted by the staff "and then it's into the Goofy suit." This is not an uncommon vicious cycle in psychologically abusive situations, where the abuser uses the pain they inflict as an excuse to lash out again. The abuser may perceive their victim's misery as ingratitude, or they may simply be enraged by the evidence of their own actions. The early days of the service industry saw a lot of companies making this trope a major policy. Happy staff tend to make customers feel more at ease even if the system is inefficient, so directors would mandate that employees smile and show as much courtesy as possible regardless of personal problems or mental state. Experts eventually realized that genuinely happy staff made customers happier but there are still some older firms that haven't received the memo.